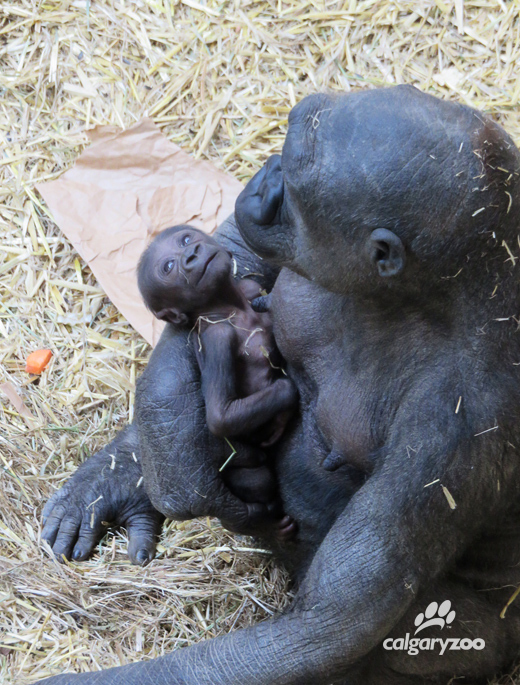 Today marks the 13th day since our baby gorilla arrived! The Animal Care team has been keeping close watch on how the little one is doing but are noticing that the baby is small and has a low weight. The team has seen very successful bonding between Kioja and her baby as well as strong paternal protective instincts from Kakinga. Despite these positive behaviours, the baby is not progressing as quickly as hoped. Our Animal Care team was able to make the determination from the beginning that they baby was smaller and weak through standard observations done to newborn human babies, close monitoring of Kioja’s and the troops’ behaviours. 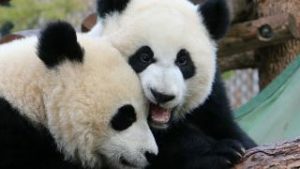 While we do have some theories on why the baby is smaller and weaker, it would be speculative. Our most important goal here is the health of the baby – physically and behaviorally. 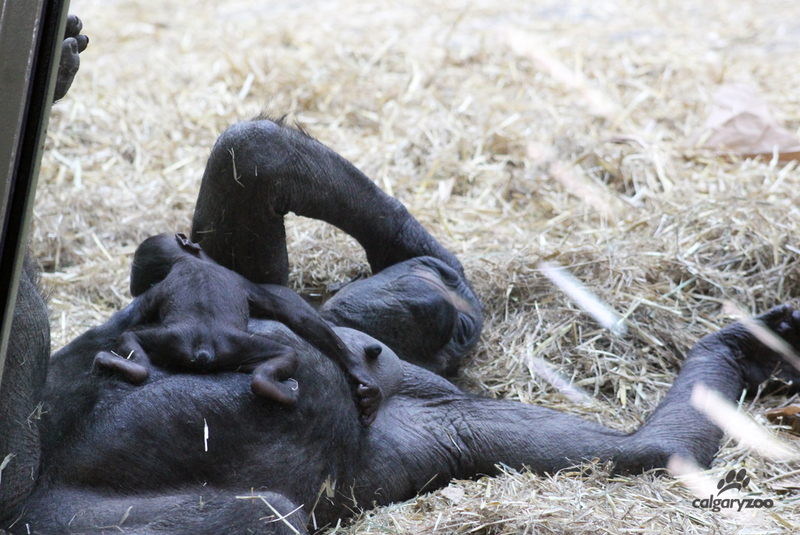 New mom Kioja relaxes with her young baby. We are continually monitoring the baby, making sure it is getting enough to eat, is well hydrated as well as pass stools and urine. Kioja is providing excellent care, keepers are supporting her and the veterinary team is examining the baby visually daily. Our next steps are to continue to assess the baby and make decisions as need be. We are on a day to day basis as we know things can change quite rapidly. Much like with human babies, we know that there are ups and downs in the early stages of life. Animal Care will only step in when it is absolutely necessary and when our veterinarians feel that medical treatment is needed for baby’s survival. However, there are many steps from now to then and we wouldn’t want to step in as we know that Kioja is doing a great job as a mom and Kakinga is doing a great job as dad. After performing a check-up for the new baby, the animal care team hand fed her to make sure that she was eating a good amount. On Sunday, March 13, 2016, the team did have to step in as the baby seemed weak and not alert. 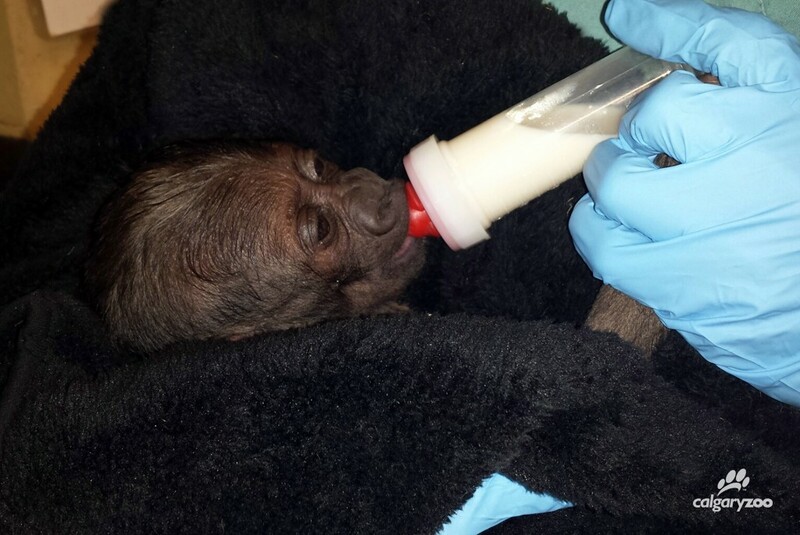 Kioja was anesthetized and the baby was given fluids and nourishment. Since then, the baby has made incremental gains but still has low weight. The TransAlta Rainforest Building will reopen to the public on Tuesday, March 22, 2016 on limited hours from 12 p.m. – 4 p.m. Our Animal Care team is looking to restore some routine for the gorillas and allow them to be comfortable with guests and large crowds. As we monitor the baby’s progress we will look to open the building after the 22 of March. All updates for the TransAlta Building’s hours and closures will be posted to the red flag on the front of our website. We thank our members and visitors for their patience and understanding in waiting to see the new little one!